Whoa, that first post was pretty heated. I don't anticipate them all being me on a soap box. Today's post will be for those of you who like their salsa mild. Officer and I met in college - before he was a cop. And clearly we went on very different first date's with each other because neither of us recall it quite the same way. Or even close. I was your typical old fashioned girl and I wanted Officer to actually ask me on a date, you know, use the words "WILL YOU GO ON A DATE WITH ME?" Since he did not, before the waitress even took our drink orders, I let her know we would be on separate checks. (: Now, for those of you out there thinking I was mean to Officer, please know that I had been courting him for months. He was just now giving me the time of day and it was my turn to play hard to get. Anyways, a short background story on us. While we're on the subject of guns, I never like to ask Officer if he is carrying his because I don't want others to know/panic. "Hey Babe, Do you have your gun?" Cue mass chaos throughout the store. So, I always try and be sly when I'm asking him about it - epic failure. "Hey, are you hot?" - You know, people say "I'm packing heat", so if you're packing heat, you're hot.... no? He didn't get it either. "No sweety, I'm fine. Are you hot?" Then, I started asking if he wanted a pickle. There isn't any logical reason behind this one, but I thought that might be why he understood. Again, not the case. "Do you have a pickle?" "Um... no?" Then, when he finally figured it out he said "Babe, I have a pickle, just so you know" "Um... ?" Ha, so we officially cannot be sly when asking if he has his gun. Any good tips out there for this one? Or will we forever be that couple walking around talking in a code that the other one doesn't understand? Let's be honest, we probably will be. But we'll also be the happiest couple walking around doing that, forever in laughter at the other. Any other cops wife's out there with a good story about adjusting to this life style? Please share! Hi there! I'm another new cop's wife (and a brand new blogger as well) and I found your blog through another blog! 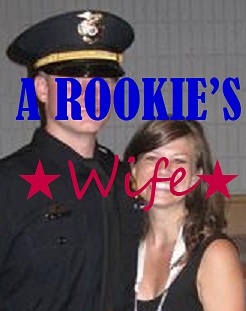 My hubby and I have been married a little more than 2 years but he's just been out of the academy a few weeks. It's definitely been an adjustment for me/us and I appreciate finding other police wives' blogs too! You can check mine out at www.mypolicewifelife.blogspot.com. I enjoyed your posts! The NYPD requires Officers to carry their weapon at all times, on and off duty, within the confines of the Five Boroughs. SO I don't have to ask...!